The band is inserted around the upper stomach by keyhole (laparoscopic) surgery. The device is made up of a pliable band to which is firmly attached an inflatable balloon. This balloon on the side of the band is connected by a tube to an injection port. The band is positioned around the upper part of the stomach so as to create a small pouch of only 20-30ml in volume. The band, by squeezing the stomach, determines the opening or outlet from the small pouch and this limits the amount of food that can pass out of the pouch. This device helps induce weight loss by two mechanisms: it restricts the amount of food that the stomach can hold at any time by inducing an early feeling of fullness and it slows down the emptying of the upper part of the stomach thereby decreasing food intake. The size of the stomach outlet is adjusted by regulating the volume of fluid in the balloon. The volume in the balloon can be adjusted by injecting or removing fluid from the band at anytime after the operation through the injection port. The injection port is placed under the skin of the abdominal wall. Since the insertion of the adjustable gastric band does not involve any stapling, resection or shortening of any part of the stomach or intestines, the function of the digestive system remains intact. All ingested food will still be absorbed by the body the same way that it was before the operation. Weight loss is achieved by helping induce early feeling of fullness after eating considerably smaller amounts of food than before. You may have your regular medications converted to liquid form and /or given instructions to crush tablets to allow easier ingestion. The operation is usually performed as a day case and takes between 45 minutes and 90 minutes to perform. At 2 years the expected excess weight loss is around 40-50%. Eat slowly and follow the advice of the dietitians wrt type of food, texture, speed of eating and volume of food ate. The Gastric Band operation is not without complications and it is important that you fully understand the risks and discuss this matter with us before you decide to have this operation. Some patients have trouble adjusting to their new eating habits; they repeatedly eat too quickly or too much and then vomit. The band does NOT work by making you vomit. Bleeding and infection (chest, wound, urine) common to any operation performed. An infection may develop in the port area or in the abdomen, and in some instances be necessary to remove the band. Deep Venous Thrombosis and Pulmonary Emboli Obese patients have a higher risk of deep venous thrombosis (DVT)which are blood clots developing in the leg veins. These clots can break away and circulate into the lungs as a pulmonary embolus (PE). We do our best to significantly reduce the chance of this happening by prescribing medicine to thin the blood. This is given before your operation, whilst an inpatient and up to 7 days after you have left hospital. We will teach you to give it yourself as an injection or make arrangements for it to be given. You will also befitted with special gradated calf stockings. Hairloss Not a major problem following this type of operation. 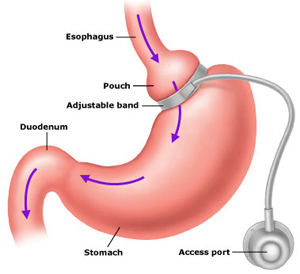 Leakage Leakage from the gastric band or from the connecting tube between the balloon and the port may occur. Leakage from the connecting tube can occur if the injecting needle is inserted incorrectly. Leakage from the port can occur if the incorrect needle is used for injecting or removing fluid from the port. Slippage of the band and pouch dilatation The pouch (the part of the stomach above the band) may become too large. This problem can arise months or years after the procedure. It can occur if the strict rules of eating and ignoring the signs of fullness are not adhered to. If this occurs, a re-operation may be necessary. Erosion Rarely does a gastric band erode into the stomach. Sometimes this is associated with pain, other times it simply presents as weight gain post surgery. If it occurs the band needs to be removed. Pregnancy	Woman within the child bearing age should NOT become pregnant for at least 2 years following surgery. Contraception	The best means of contraception for females is either a intrauterine coil or a depot injection. There is no guarantee that the gastric band will work without fault for the rest of your life. However, extensive use of the gastric band since 1985 demonstrates that it works will and can be complication free with long term weight loss. This complication-free and successful weight loss is more likely to occur in patients who have a clear understanding of the potential benefits and risks of having a gastric band and have a realistic responsibility towards their eating habits and exercise. fluid goes into the band initially. The first band fill will be performed 6-8 weeks post op in the out patients. It may take several visits to get it right, every patient is different. If the band is too tight you will vomit, get heartburn and regurgitate at night. Not tight enough and then you will not feel full. Experience has shown us that regular follow up of 4-6 weeks is key in the first 6 months following the insertion of the band to get the best results. 20% of patient with gastric bands in place may need to have to have their band removed because of complications.If you vomit regularly, suffer heartburn or cough at night your band is too tight until proved otherwise.